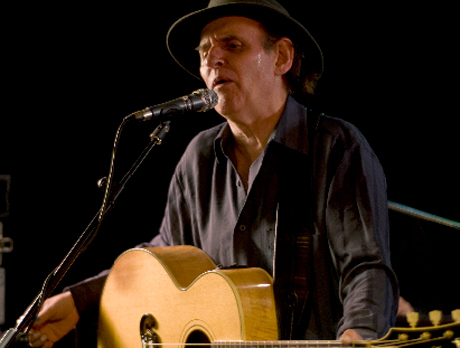 Outside folk music circles, Ron Hynes isn't a particularly well-known name amongst Canadians, but he's rightfully revered as a regional treasure by the populace of his home province of Newfoundland. That's confirmed by this appealing documentary look at the veteran singer-songwriter, directed by a fellow Newfoundlander, acclaimed filmmaker William D. MacGillivray (Life Classes). Man of a Thousand Songs takes a fittingly low-key approach to his career and life, drawing the laconic songsmith into recollections and insights. He admits to having multiple personalities, something confirmed by his nephew, writer Joel Thomas Hynes ("you never know which side of Ron you'll get"). His inner demons (including a cocaine addiction) are explored in the film, and Hynes faces up to his personal shortcomings with oft-lacerating candour. He's not averse to a little self-mythologizing either, admitting at one point that "the line between truth and legend in my life is very thin." Thankfully, a self-deprecating sense of humour is often on display. Making a memorable appearance is fast-rising young songstress Amelia Curran, and her duet with Hynes on one of his classic songs, "The St. John's Waltz," is a musical highlight. It would have been nice to get comments from Hynes's peers or music industry types on the man's talent as a songsmith; his music has been covered by such major international artists as Emmylou Harris, Christy Moore and Mary Black, as well as top Canadian folk and country acts.